Cosmopolitan Industries has had a life-changing effect on countless adults and their families through nearly half a century of miracles. It’s a social enterprise that welcomes adults with intellectual disabilities and offers them a social atmosphere, an allowance, as well as vocational skills. “I wasn’t planning on doing that when I came here because I was all about doing my work first and that’s only it. But after, truthfully, after two years and everything, I’ve made a really good couple friends here,” said participant David Tomyn. Life enrichment is one of Cosmo’s pillars. They have band practice as well as a multi-sensory room to take a moment and relax. Cosmo is also home to industry. Local businesses send work to the site, where large projects are broken down into small tasks. “We take a look at the big job, say ‘how can we do this so everyone is successful?’” said Cosmo program leader Randine Graf. Every month, researchers receive 10,000 to 12,000 planting pots. Each one is scrubbed, washed and repackaged at Cosmo. However, it’s in recycling where Cosmo has left its broadest impact across Saskatoon. A powerhouse in the industry from 1976 to 2012, Cosmo lost the bidding for the city’s curbside recycling contract six-and-a-half years ago. Now it focuses on multi-unit homes, along with commercial and depot material. “A lot of the extras that Cosmo’s able to do for the program participants, that revenue is coming from the recycling department and the shred department,” said recycling manager David Troesch. From 15 people in 1970, Cosmo has grown to its current program to 400 adults and 130 staff members. Joanne Corniere is the longest-tenured employee. The licensed practical nurse, who was hired in 1974, has witnessed virtually every step of the company’s evolution, and even worked in the golf club division. “We had goals, we weren’t going to be beaten. We produced an awful lot of golf clubs up there,” Corniere said. Another pivotal moment for Cosmo came in 2016 when a pipe burst, flooding the main level, destroying flooring, walls and other property. “Everything fell apart and the water came flooding out pretty quick, so it was a day of running around, gathering up as much as we possibly could and reorganizing ourselves,” Corniere said. St. Michael Community School learned of the flood and came to Cosmo’s aid by organizing a recycling drive one morning. “By the afternoon, people were stopping, unloading their bottles, it went on for about 10 days. Then the students crushed them, took them in, and went over to Cosmo and presented them with a cheque,” said Gail Hendry, who is with the school. 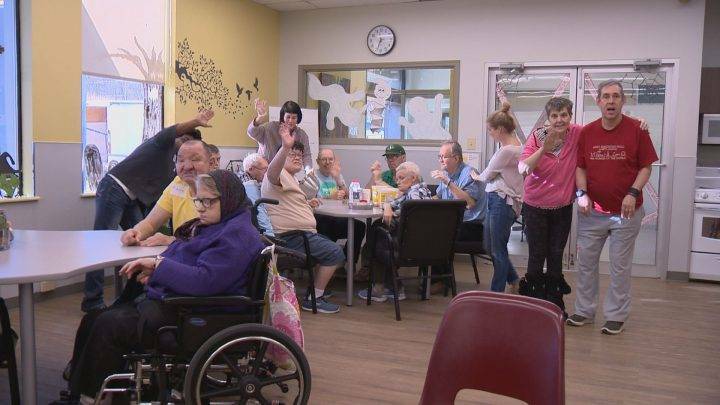 Renovated day program building reopens in Langenburg, Sask. Such moments of kindness have been compiled into a new book authored by Saskatoon journalist Ned Powers. “We call the book Cosmo’s Miracle on 34th Street. We could’ve called it many miracles because there have been many miracles here,” Powers said. “That’s what Cosmo’s secret has been is to provide a sheltered environment for people to live productive lives because sitting in the basement, watching the paint peel. There’s no humanity in that,” said Cosmo board member Mike Stensrud. Looking to the future, Cosmo wants to expand to new satellite campuses, welcome more participants, and continue flourishing.